For an all male group over 8 persons, from all groups larger than 12 persons a security cash deposit of 200 EUR will be required on arrival. Groups larger than 14 people need to hire the entire property, then the purpose of travel does not matter. LOCATION: Right between the Old Town and the Center of Riga, few minute walk from all main transport hubs and steps away from a supermarket, Cinnamon Sally probably has the best location in town. COMFORT: Fresh made beds with big towels, big lockers for shared rooms. All the showers are private and lockable. Free internet and high speed WiFi in the entire hostel, 12 PM check-out. SOCIALIZING: A big and comfortable common room and a fully equipped kitchen is there for you to socialize and enjoy a cold beer from Cinnamon Sally's Beer Fridge. !!! !!! !!! NO STAG PARTIES ARE ALLOWED IN THE HOSTEL!!! !!! !!! !!! NO GUESTS UNDER 18 YEARS ARE ALLOWED IN THE HOSTEL !!! !!! IF YOU ARRIVING AFTER MIDNIGHT, PLEASE LET US KNOW BEFOREHAND !!! 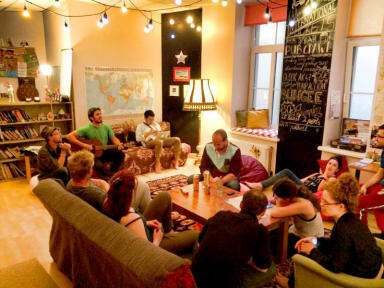 The hostel reserves the right to cancel bookings from locals (residents of Latvia) as the hostel is for tourists only. Most guests here are aged 20 to 35 but we're open to all age groups, although we don't allow school groups or stag parties. INFORMATION: Information on Riga and Latvia is supplied and updated by staff who are locals with plenty of hostel experience and good language skills. You will receive a free map of Riga upon your arrival and enough information to get you around Riga for a few exciting and informative days.